Nail Drill 30,000 rpm twist lock handpiece, 4 drill bits,110 volt only! 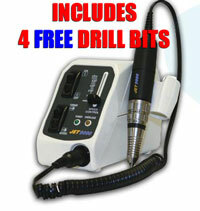 e-file electric file drill with 4 FREE nail drill bits. Files fast and easy. Enjoy effort-free filing with this Jet 9000 E-file electric nail drill. A fast, easy way to file, smooth, and finish the surfaces of nail extensions.